The best yachts for charter are the ones where you board the yacht and cannot help but gasp with pleasure as you walk through the aft doors into the interior. Architecture has been famously described as the poetry of space, and yacht interior design takes this concept and runs with it, with flowing spaces that effortlessly combine superyacht glamour with luxurious comfort and huge windows that flood the yacht with views of sea and sky. Decadent indoor-outdoor living is commonly delivered in communal spaces, while yachts’ staterooms offer elegant and sumptuous spaces in which to relax and unwind in privacy. 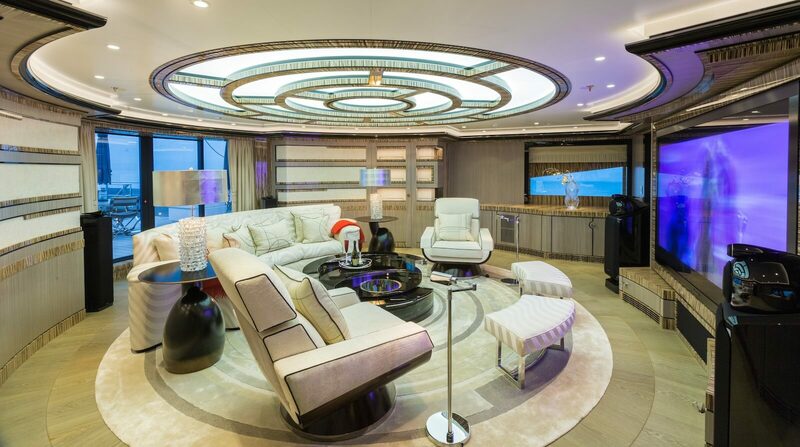 Whether you prefer modern airiness or classic decadence, there is a yacht interior design to meet your charter needs. Here are three of the bestyacht interior designs, each of which can be found on vessels available for charter in the Mediterranean this summer. 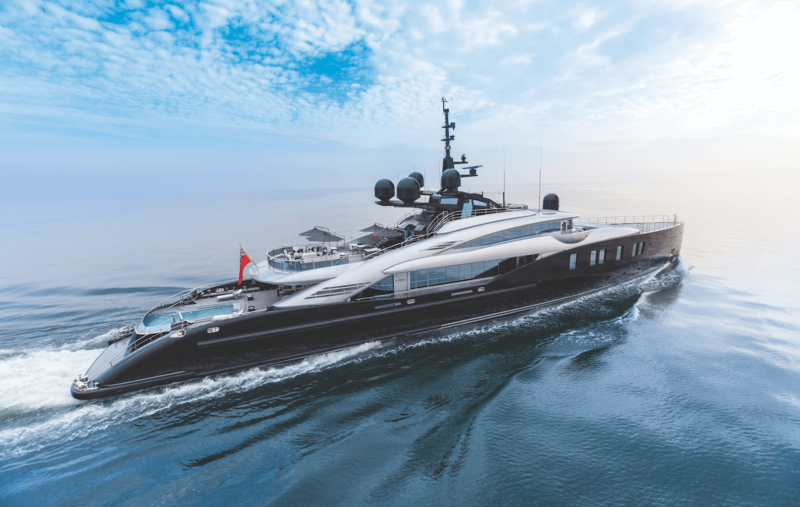 Built by the ISA Shipyard, M/Y OKTO is an award-winning 66.4m superyacht that turns heads wherever she goes, with her sleek exterior lines, a 6m infinity pool on her aft deck, and striking black and grey decks. The magnificence continues inside, with a spectacular high-gloss interior by the late Alberto Pinto that is finished by List of Austria. The main salon is opulence embodied, with dark lacquered wood, mirrored-glass, pale satin wood floorboards, velvet-soft white furnishings, huge windows and sliding doors. An adjoining dining room is exceptionally elegant under a feature golden light, while upstairs, the sky lounge is set up as a high-class cinema in a sweeping curve. M/Y OKTO accommodates up to 10 guests in five palatial staterooms, with a glamorous master suite with an opening skylight roof and a drop-down balcony, and a main deck VIP suite with a study area and floor-to-ceiling windows. The three lower deck staterooms are modern and spectacular, with crisp white linens and splashes of bright colour bringing a fresh lightness to the atmosphere of the vessel. Other special features of M/Y OKTO include a gym, an elevator, and extremely low noise and vibration levels. For high glamour in a smaller, sportier yacht, the 34.0m M/Y CHEEKY TIGER is easily one of the best charter yachts in the French Riviera. There’s nothing quite like speeding along the glittering coastline of the French Riviera in a sleek and powerful performance superyacht, and M/Y CHEEKY TIGER’s striking interior and charter-friendly layout makes this Leopard-built superyacht a fabulous charter option. The interior décor by Tamara Bernerd is dramatic and sophisticated, with a light-filled salon with art deco touches, four stunning staterooms, and a media room which converts into an optional fifth stateroom. Every detail is perfectly finished and of the highest quality, with Hermes crockery, Christofle silverware, and Baccarat crystal just a few of the high end brands carried onboard. The superyacht’s interior is a superbly executed melange of colour and fabrics, creating a fresh and modern look of exceptional luxury. Out on deck, guests can relax in a glamorous sunken sunpad and lounge area on the foredeck, dine and sunbathe on the aft deck, and zip around on the yacht’s watertoys, which include a phenomenally fast Ribeye Revenger chase boat that travels at speeds of over 50 knots. With stunning Great Gatsby-inspired interiors and a huge range of special features, the 63.0m M/Y .11.11.is one of the best charter yachts in the Mediterranean. This award-winning yacht from the Benetti Shipyard has an astonishing art deco-styled interior of black, white, and mirrored-glass. 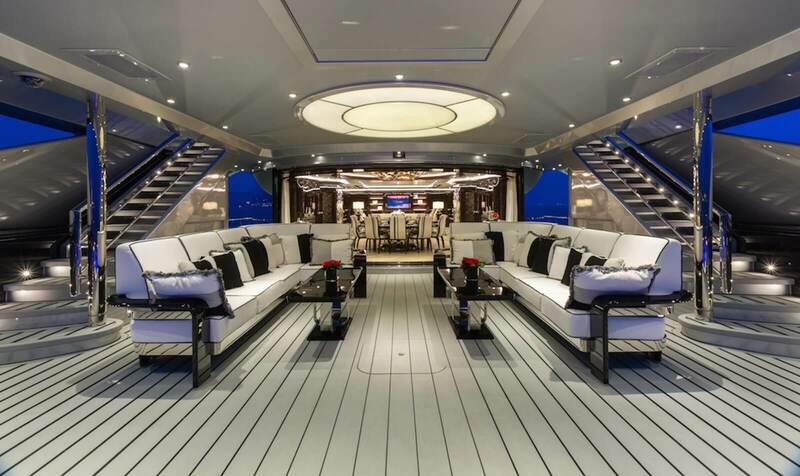 Plush furnishings and extra-large windows make this superyacht the ultimate in designer sophistication. 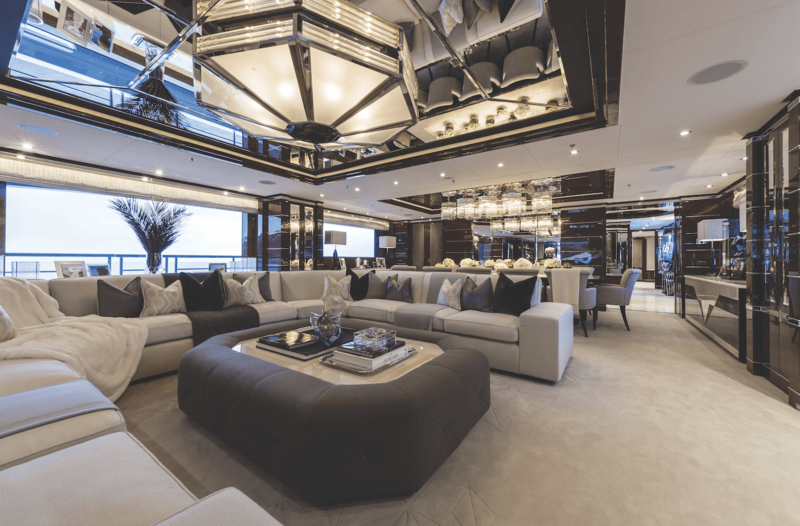 Silk-soft rugs and geometric shapes make the luxury superyacht a visual feast, and crystal chandeliers of incredible delicacy reflect in the high gloss wood. M/Y .11.11. accommodates up to 12 guests in six expansive staterooms, including a vast private Owner’s deck, with a huge curve of windows overlooking a private terrace. Up on the sundeck, guests can relax in the light-filled massage room or steam room, sit back with a cocktail in the marble-edged Jacuzzi, or find a deckchair on the incredible axe-bow for spectacular views underway. Other special features include her amazing range of watertoys, which include a limousine tender, jetpack, and seabobs. The best charter yachts offer a visual richness that cannot be paralleled and luxury that cannot be imitated.